When I spotted the Savory Cheese Rolls recipe on Red Star Yeast's site I immediately thought they would be great rolls for Thanksgiving and a (Parve) Chanukah. I also thought that on a balmy wintery day they would go perfectly with a piping hot bowl of chili. 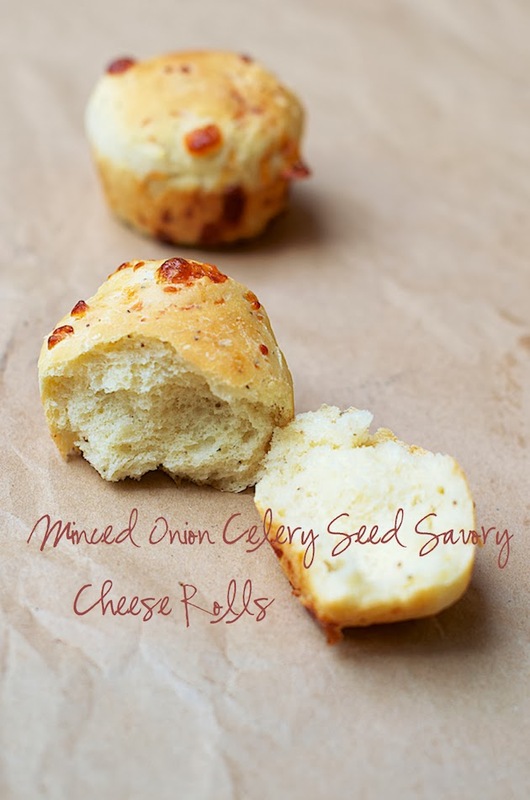 Seems like Red Star Yeast was thinking summer BBQ rolls, so really these Minced Onion Celery Seed Savory Cheese Rolls are a year-round crowd pleaser. 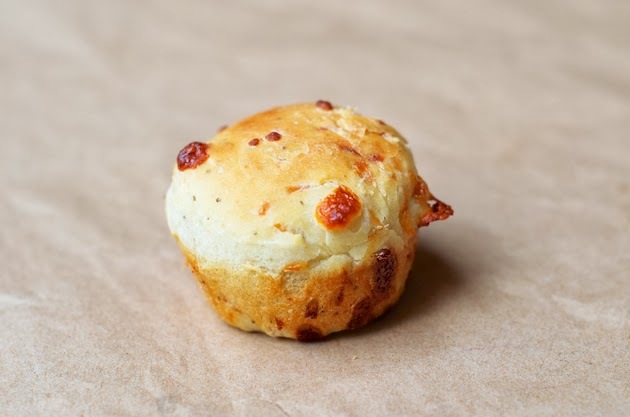 While the dough is soft and sticky, once it proofs the first time, just tear a piece of dough with your hands, if you wish, instead of spooning into the muffin tins as instructed. It is sticky but yet workable. 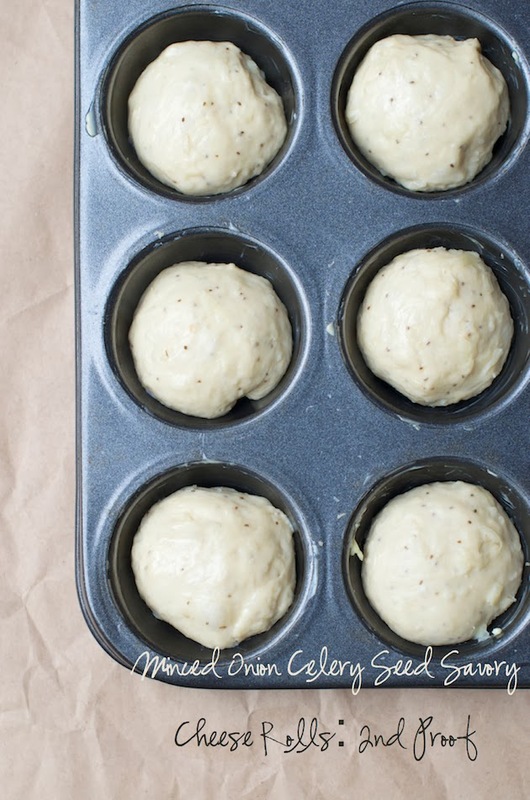 I inverted each ball of dough and tapered it at the bottom to achieve uniform looking rolls. I suspect that even if you don't take this extra step, by the time it proofs in the muffin tins for the second time around, it will all even out and the muffin tin will lend its shape to the roll. I used exact measurements called in for in the recipe. The explanation on the added milk in this baking tips explains the feathery soft savory cheese rolls achieved here. You might wish to dust the muffin tins with flour after greasing the tins so the rolls will pop out easier when cooled down. If dusting with flour, turn the muffin tins over the sink to rid of any excess flour. I was successful prying the rolls out gently, all in tact, without that extra dusting step, but keep in mind the melted cheese will stick to the tins. The rolls are really fantastic warm or at room temperature. I gave one roll, as it came out of the oven, to Jonathan, while he was mowing the lawn and blowing the leaves. It's pure satisfaction, on a brisk fall day, outdoors. On to the minced onion and celery seeds. I have never used either one of these spices in the past. Minced onion was an ingredient I was introduced to when I came to the US over two decades ago. It was an ingredient Jonathan's Grandmother or great aunt in Florida might or might not have used in their casseroles. Little had I known that both spices are such a staple in every day American cooking. You can see the discussion here, here and here. I was especially blown away how wide spread the use of celery seeds is in potato salads, mac and cheese, soups, and even on the rim of a bloody Mary. I was happy at all of these discoveries. 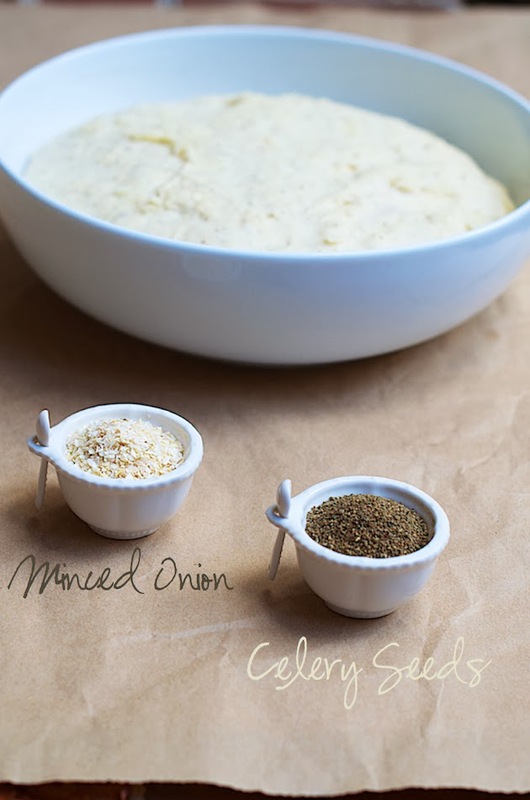 Both minced onion and celery seeds will be used again in making these, as I like to call them, buns, and making an appearance in all of sort of dishes in my kitchen. A revival of sort, I would like to think, even if it eluded me in the past. In large mixer bowl, combine 2 cups flour, yeast, sugar, onion, salt and celery seed; mix well. In saucepan, heat milk, water and shortening to 120-130°F (shortening does not need to melt); add to flour mixture. Add egg. Blend at low speed until moistened; beat 3 minutes at medium speed. Stir in remaining flour to make a soft batter and add cheese, by hand, gradually. Cover; let rise in warm place until light and doubled, about 30 minutes. Stir down batter. Spoon into greased muffin cups. Cover; let rise in warm place until light and doubled, about 30 minutes at most. Bake at 400°F for 15 to 20 minutes until golden brown. Serve warm. 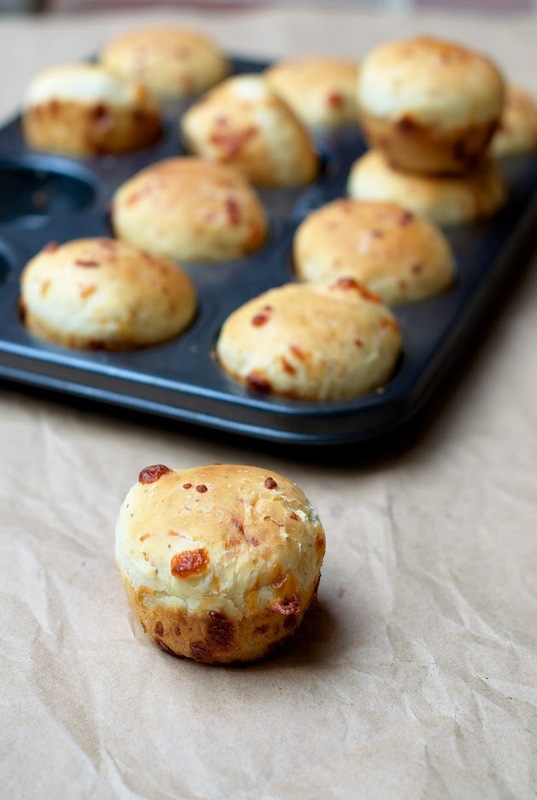 I love the sound of these savory rolls, they'd be wonderful with soup! Wonderful little rolls! That flavor combination is great. TY, Rosa. They are yummy little gems. What a genius idea! These look fantastic! Can't wait to give this a try, I just bought muffin tins for the holidays! Yay, Ali, for the muffin tins. A great little trick for these rolls isn't it?! I just learned celery seed is a good way to cut down on salt since it's naturally high in sodium. Who knew! Want to make these now! Pinning! TY Serena for the pin & tidbit of information here enhancing the 411 on this post. Good to know. My mom always used celery seed in he purple cabbage coleslaw. I loved it on hot dogs. This shows there are lots of ways to use celery seed-which is a good thing since I like it. These rolls sound scrumptious! I'm all over these rolls Shulie! Minced onion gives bread such a great bite, and I have a jar of celery seeds that I never use. Love how the sticky dough result in airy rolls. These are amazing! And your mini bowls with spoons, so ridiculously cute! They remind me of the individual salt bowls my mother got for her wedding. Drooling over these savory rolls. Love the little white bowls in the photos. Thanks for baking our recipe! וממש יופי של מרקם יש להן!! 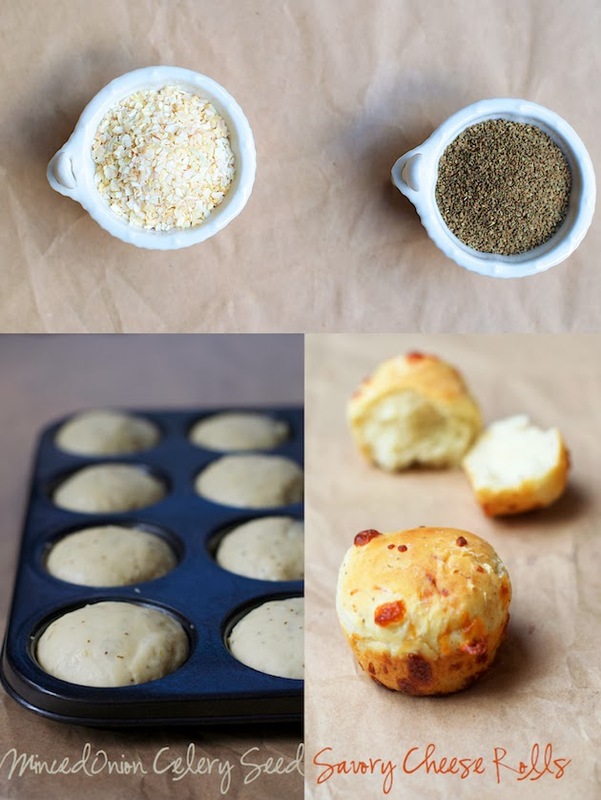 Savory bread rolls, anytime. I could eat a whole lot of them.